The standard BioWash formula is offered in two different dilutions: BioWash 25 and BioWash 100. Both can be applied by either foliar means or at the root/soil level of plants. BioWash 100 is our standard BioWash pure concentrate. BioWash 100 will treat an average of 20 acres of low growing row crops one time in a season at the rate of one (1) ounce of BioWash 100 to four (4) gallons of water and/or combination of water and liquid agricultural solutions. Higher growing crops or trees may require more solution. We recommend a minimum of three (3) applications of BioWash in a season. BioWash 100 is sold in minimum gallon quantities. BioWash 25 is our 25% concentrate. BioWash 25 will treat an average of 5 acres of low growing row crops one time in a season, at the rate of one (1) ounce of BioWash 25 to one (1) gallon of water and/or combination of water and liquid agricultural solutions. Higher growing crops or trees may require more solution. We recommend a minimum of three (3) applications of BioWash in a season. BioWash 25 is sold in minimum quart quantities. BioWash Soil Amendment is formulated to treat heavily contaminated soils that have been impacted by over fertilization or contaminants (such as oil spills). Soil Amendment is also very effective on heavily compacted soils, working to dissolve residual chemicals into particles small enough to be lifted and washed away. Soil Amendment produces similar results in plant growth and yield as our regular BioWash formula, however, we do not recommend that it be applied at the foliar level of plants. 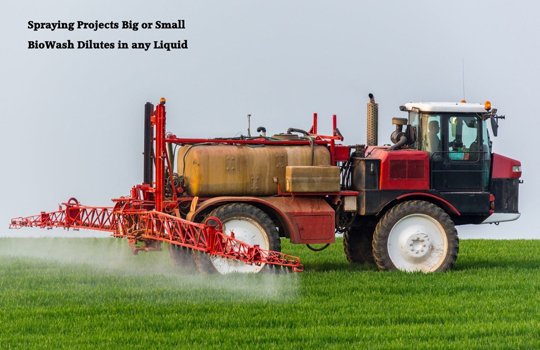 This is because Soil Amendment contains heavier duty degreasing agents than BioWash 100 and may dissolve the natural oils on plant leaves, opening them to additional insect and disease attack. Soil Amendment will treat up to 20 acres one time in a season. As with our regular BioWash formula, we recommend applying Soil Amendment to the soils around crops at least 3 times during the growing season; more often is better. Soil Amendment is offered in minimum one gallon quantities. Our BioWash solutions are very forgiving. The key to proper application is to assure there is sufficient liquid to completely drench plants and/or trees. These solutions must be able to adhere to the surfaces of plants and roots to be effective so must be in sufficient quantity to drench them well. You may read more about our BioWash Solutions by reviewing our BioWash Q&A Brochure. Expanded BioWash Application information can be found in our BioWash Application Guidelines.